There are thousands of planets orbiting stars in Earth’s galactic neighborhood. Scientists are spotting new planets so fast it’s hard to keep up -- and many of them could be habitable. “I think we're going to have strong indications of life beyond Earth within a decade,” said NASA chief scientist Ellen Stofan last week. “I think we're going to have definitive evidence within 20 to 30 years." Indeed, we might find alien life right here in our own backyard, just a few planets over. Life -- at least, life as we know it -- requires liquid water, more and more of which keeps turning up around the solar system. 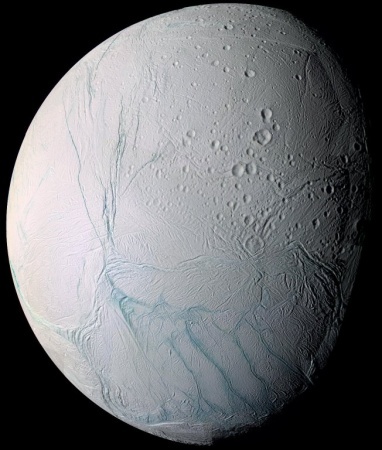 Research published last month in the journal Nature says one of Saturn’s moons, Enceladus, has water that’s near boiling -- cozy, for certain forms of life. Rather, experts say there’s a good chance of finding microbial aliens. After all, by some measures microbes are the dominant form of life here on Earth. 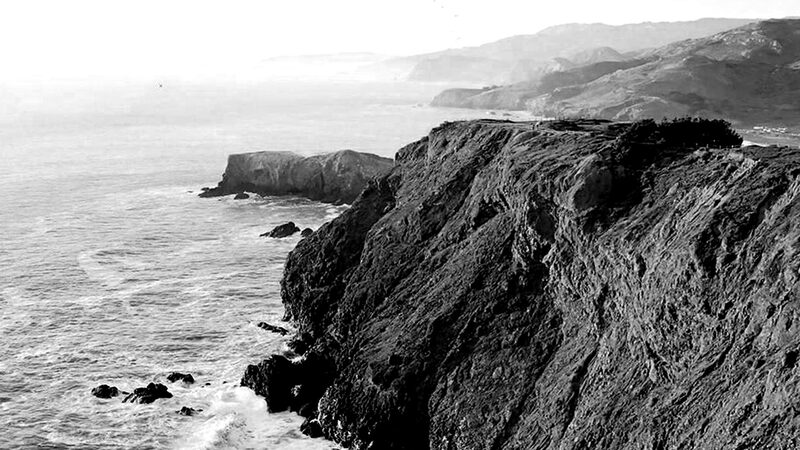 They were here a couple billion years before us, or dinosaurs or even jellyfish. Inside NASA's greenhouse are boxes containing thick carpets of what Hoehler calls “orange goo.” It’s hard to fathom, but this is almost entirely made up of microbes. As scientists develop an ever clearer picture of the outer solar system, the odds of finding a place that resembles a slime world are looking decent. Saturn’s moon Enceladus is tiny – just 300 miles in diameter. 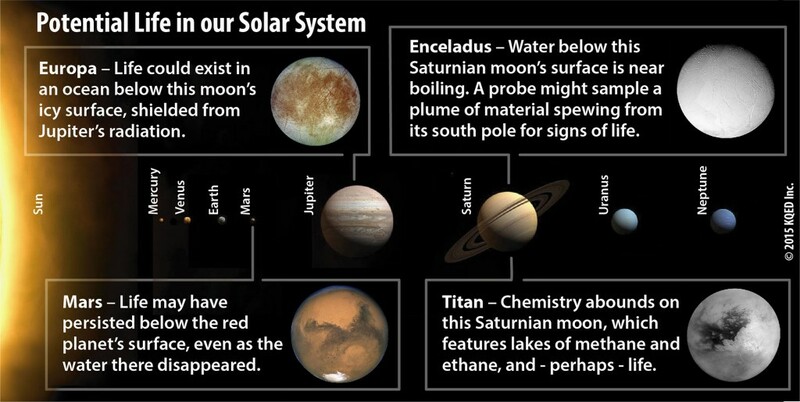 It doesn’t have the mysterious methane lakes and dense atmosphere of Titan, another one of Saturn’s moons. It also lacks the convenient proximity of Mars. Trips to the red planet from Earth can be measured in months, while missions to Saturn take years. 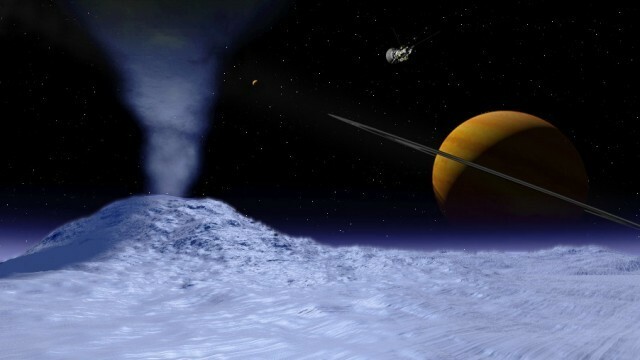 Planetary geologist Cynthia Phillips says Enceladus’ claim to fame are its geysers, which spew ice out into Saturn’s rings. Phillips works at the SETI Institute in Mountain View. SETI stands for Search for Extra Terrestrial Intelligence, although for Phillips, that last bit is not a deal-breaker. Moons orbiting gas giants like Saturn and Jupiter are subject to immense gravitational forces; these pull on and flex the moons’ crusts. The resulting friction leads to a process called “tidal heating.” Phillips points fondly to a globe of Europa. The icy moon that orbits Jupiter is a potential candidate for life (and future exploration) and is Phillips’ avowed favorite. Being five times as far from the sun as Earth, Europa gets 25 times less energy, meaning life there can’t bank on the sun for warmth. Tidal heating could be a tidy alternative, keeping some water in liquid form below the surface of moons like Europa and Enceladus. Recent research from the University of Colorado, Boulder, suggests that water under the surface of Enceladus is actually quite hot – 194 degrees Fahrenheit – well within the known parameters of life. Shostak says there are several places in the solar system where life could turn up. In addition to Europa, there are signs of subsurface oceans on two other moons of Jupiter: Callisto and Ganymede. And those oceans are some 20 times deeper than Earth's Pacific Ocean. If it has, life there could well be quite different from Earthly biology. DNA may not even be a factor. In fact, alien life could theoretically get by without carbon or water at all, instead substituting alternatives like silicon and ammonia. While some astrobiologists say this “weird life” could occur in the clouds of Venus, most believe life in the solar system is staked around liquid water. And as more data streams in from nearby stars, it looks like about one in five has a planet somewhat like Earth. That’s a very big number, Shostak says – and keep in mind, there are 150 billion other galaxies out there, at least that we can see.